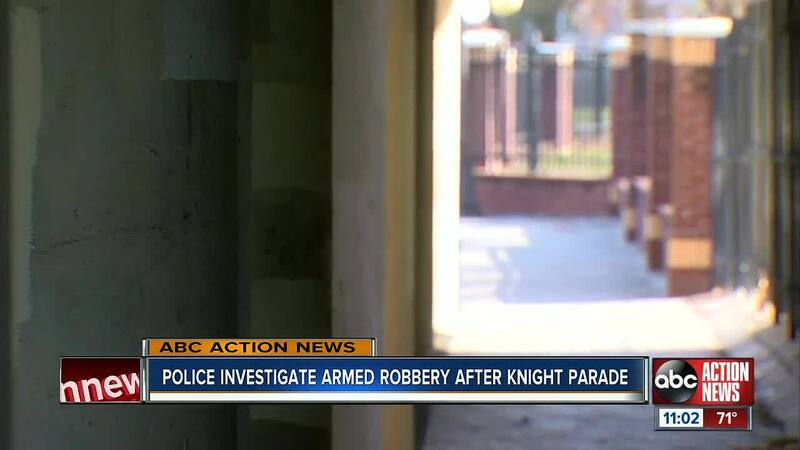 TAMPA, Fla. - Police confirm a Tampa woman was robbed at gunpoint after Saturday night's Knight Parade in Ybor City. The victim did not want to speak on camera, but she said she was walking with a friend when the robbery occurred. She said they passed the HCC campus and were approaching the bridge when a man asked them how they were doing. She said he pointed a gun at them and stole all their possession, including their wallets with credit cards and cash. “It’s very disappointing and shocking to hear that that did happen especially a big night like that with everybody around too,” Tim Merritt said. Merritt lives in Ybor City. He feels safe and has never had any issues. “I walk my dog here every night for about an hour. We walk down that way. We come around. We do a couple of laps,” Merritt said. People who frequently visit Ybor City are surprised the armed robbery happened nearby. “Actually, that’s very unusual. Ybor is actually pretty safe." said Mike Fiducia. "You really don’t hear much of anything like that happening. You hear more of that happening in different areas." Tampa Police said the armed robbery happened off 14th Avenue and Avenida Republica de Cuba. “I’m down here quite often. It’s not uncommon to kind of feel unnerving, but you definitely want to be in a group when you’re down in Ybor,” said Ryan Cotto. The victim said she liked walking from her house to the strip, but does not plan to do that anymore because of the robbery.